I no longer update the articles on this page, except for the Guide to Luthiers and Guitar Techs in the Philippines page. I decided to write smaller articles on Facebook, which you can easily share to your friends with a simple click of the Like or Share button. It is also easier to interact with readers on FB. Check out the Guitar Buying,Owning, and Selling Guide on Facebook. 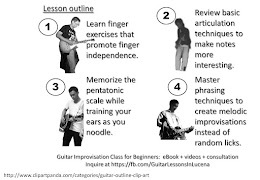 I also wrote an ebook entitled GuitarImprovisation Class for Beginners. For inquiries you may drop a message at Guitar Lessons In Lucena City. You may also check the FAQ here. Some of you may not be aware that I also manage Tom's Guitars Manila on Facebook. Tom is a guitar collector who also sells some of his guitars. Those who need emergency cash may also pawn their guitars to Tom. He will not charge interest if you redeem your guitar within two months. It is his way of helping other guitarists. You may check the FAQ here.